A: Yes! Big Lots--and similar closeout stores--can be great resources for specialty groceries. Sometimes food is there because the packaging has been redesigned or as part of a limited-release trial flavor promotion. Ours has day-old bakery items from Entemann's, Arnold's and Atkins, too. Big Lots has also incorporated an international/gourmet aisle for imported products like olives and specialty sauces. Often you'll find brands from other parts of the country, which is always fun. (An online friend who couldn't find Salada tea in Alabama stocked up when it came to Big Lots.) A price book will help you sort out the good deals. Use caution by examining packaging and checking expiration dates: this cereal was marked down because it's "best by May 24th." My husband and I hit Big Lots at least once a month. Some of the food is too weird for me, although I have found some great buys, too. The only thing I don't like about them is that they don't accept coupons. Sometimes, combining coupons and a sale, I can get a better deal at Stop & Shop. I just wanted to let you know that I have been lurking on your site for quite a while. I come here daily to read your latest finds and homemaking ideas. You are such an encouragement to me. Thank you for being a witness for the Lord and teaching others through your life. 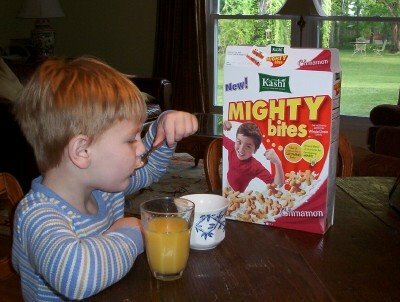 I laughed when I saw your picture - we just bought 'Mighty Bites' for a $1 at Big Lots, and my kids love it! We love Big Lots...I've gotten new Tupperware there before. After Christmas last year, I came away with a ton of neat stuff for next Christmas, gifts, wrapping, etc. Most was 75 - 90% off. My husband and I don't drink, but with special meals we do like the sparkling white or red grape juice. After a holiday, I always check there and get several bottles for less than half what it would be at Walmart or a regular grocery store. I also get scrapbook supplies there. Again it is usually 60 - 75% off the regular price. "Expiration" or "expires" dates on food mean the item MUST be pulled. Owned a health food store for over 10 years. I was told by 2 food inspectors in 2 different states that if they found food like that they would either fine or close the store down. "Best buy" dates means the food is fine but many have a lesser flavor, may be slightly stale, etc. I love Big Lots ! We went to our BL store yesterday, and I did get a couple of bottles of grape juice (one with winter and one with Valentine's Day labels) for $1.49 each (vs. on "special" at the grocery store for $2.49 each), which I have now stored in my wine rack for New Year's. We also bought a box of Finding Nemo cereal (a treat for the kids) for $1.00 (next best price I have seen is $2.50) and a couple of boxes of fruit snacks for $1.00 and $2.00, respectively (better than the grocery store). Thanks for the tip! Amber, thanks for the compliment. Anonymous, thank you for pointing out the difference between "best by" and "expiration" dates. An important distinction for the frugal shopper to note! Love Big Lots too! In fact, just found one within Chicago city limits the other day that I didn't know existed - I was on my way for a freecycling pick-up and was excited to find another bargain paradise! :) I love their off-beat grocery selection and the great deals on scrapbooking and office supplies. Now, if I can convince hubby to drive me there instead of schlepping there and back on the bus!